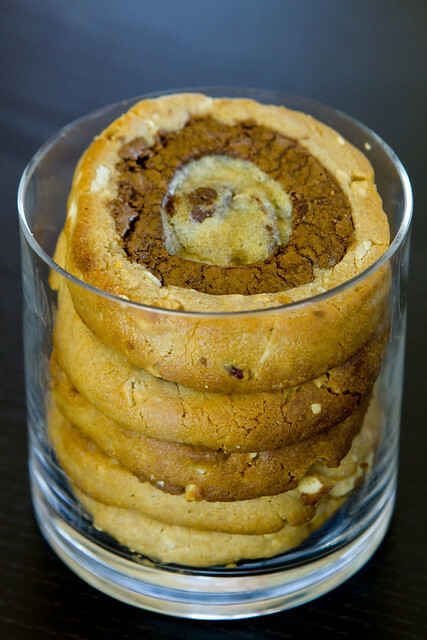 The Bullseye Cookie is a compilation of recipes: The Chocolate Chip Cookie is the original Nestle recipe without the nuts. 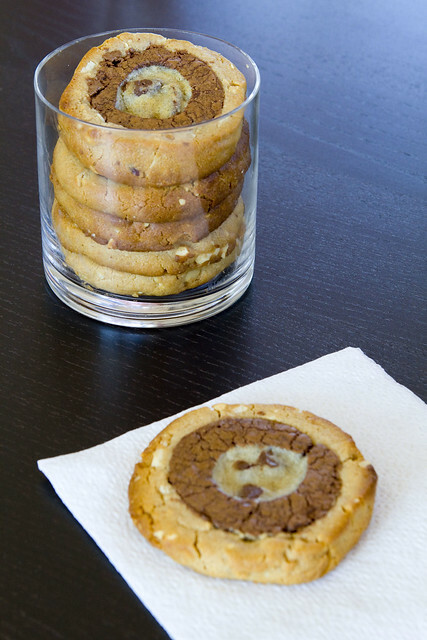 The Chocolate Cookie and Peanut Butter Cookie are both adaptations for versions found in “furniture re-arranging”. Fore more on #NYCookieSwap 2011, check out blog posts by Justin, Jackie (includes video), and Gail. Hope to see you at the next one! 1. 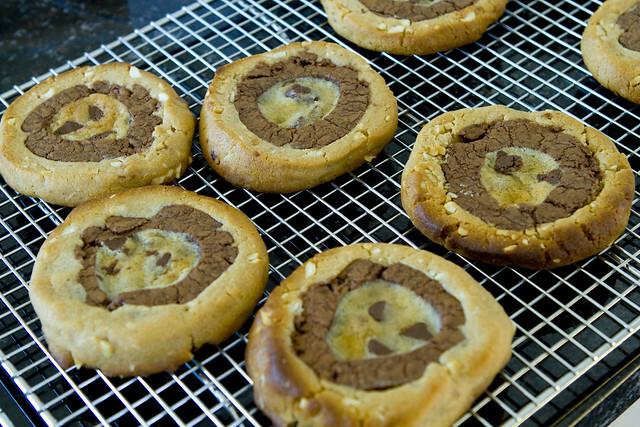 Make 1/2 the Nestle Chocolate Chips Cookie recipe (don’t add nuts). Use parchment paper to form a 12″ long, 1″ diameter log. You can use a sheet pan (or any sturdy flat surface) to tighten it, by pushing at the seam of the parchment. 3. To make the Chocolate Cookie dough, sift together flour, cocoa powder, baking powder, and salt. Set aside. 4. Cream butter on medium speed in a stand mixer fitted with paddle attachment. When it looks light and fluffy, add granulated sugar in a steady stream. Add brown sugar and mix until smooth. Reduce the speed to low and add the egg. Scrape as needed. Add in chocolate and vanilla, mixing until combined. Add dry ingredients and mix just until blended. Cover with plastic wrap and chill for 30 minutes. 5. 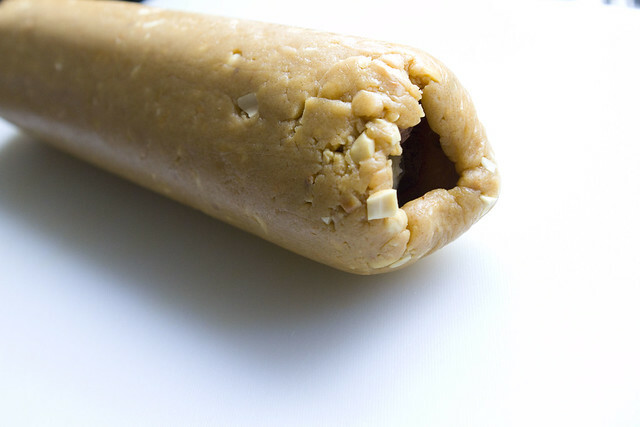 While the Chocolate Cookie dough is chilling, make the Peanut Butter Cookie dough. In a small bowl, whisk together the flour, baking soda, baking powder, and salt. Set aside. 6. In a stand mixer fitted with paddle attachment, combine peanut butter, shortening, and honey. Increase to medium speed and add granulated sugar and brown sugar. Beat for one minute. Add the egg and vanilla and beat for two minutes, or until batter has lightened. 7. Reduce the mixer speed to low and add dry ingredients. Mix just until blended. Fold in chopped nuts and chill for one hour. 8. When the first two doughs are done chilling, roll out the Chocolate Cookie dough into a half-inch thick sheet, the same width as the chocolate chip cookie dough log. 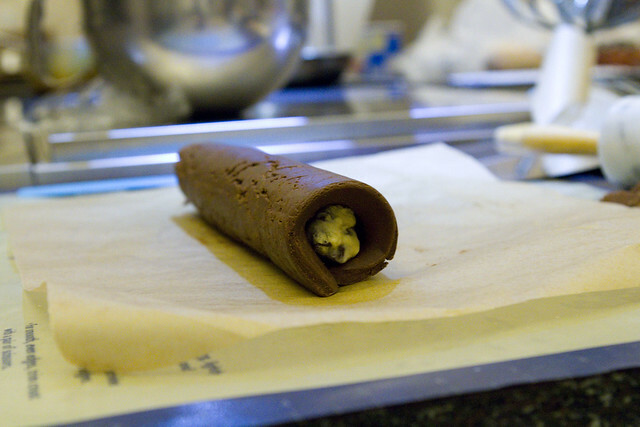 Place the Chocolate Chip Cookie dough log about an inch from the edge of the sheet and roll it up. You should have extra, use a board scraper or knife to cut it to length. Try get fairly precise. Keep in mind your math, if the center log is one inch diameter, the length should be about 3.15 inches (pi * diameter). Try to press the doughs tightly together, so there’s no air in between. 9. 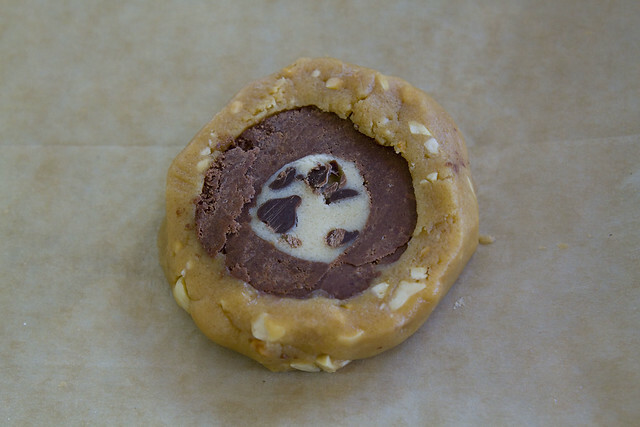 Wrap in plastic and place it back in the refrigerator until the Peanut Butter dough is ready. 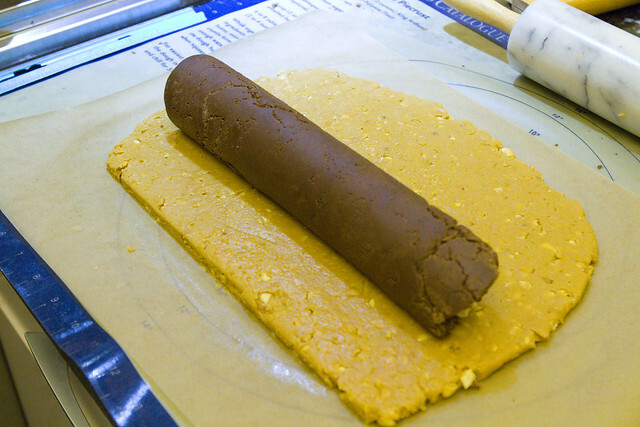 Roll out the Peanut Butter dough to a half inch thick sheet, about the width of the log. Place the previously rolled, two-layer log two inches from the edge and roll it up. 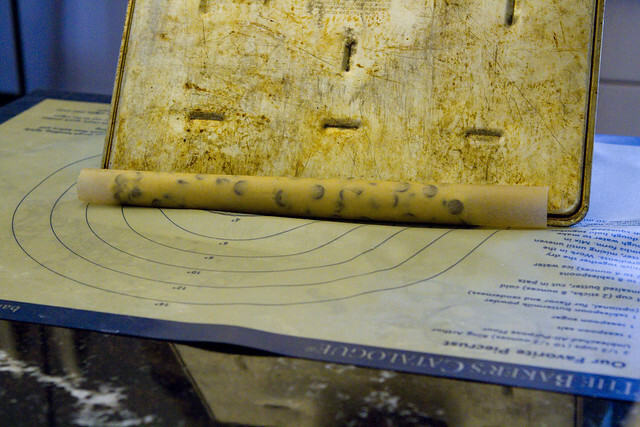 Again, try to press the doughs together and avoid air in between layers. 10. Wrap in plastic and chill overnight. 11. When you’re ready to bake the cookies, preheat the oven to 350 degrees F. Prepare a few baking sheets with parchment paper or silpat. 12. Try to slice the log into slightly more than half-inch thick slices. Place on prepared pans at least two inches apart. 13. Bake for 10 minutes. Cool for 10 minutes on baking sheets, then remove to cooling racks and cool completely. posted by jessica	at 03:28 PM	Filed under Desserts, Events, Recipes. You can follow any responses to this entry through the RSS 2.0 feed. Both comments and pings are currently closed. Totally a fun cookie. And it will make everyone happy. The pictures are very helpful. Oooh I want a stack of these! Mmmm three best cookie flavors! Gorgeous! And I am so sad to have missed the cookie swap event. Well, just another reason for me to move to New York, right? Thanks for the love ladies! Jamie, waiting for your arrival! !